One Per Case: AvX Review #1: Which side are you on? 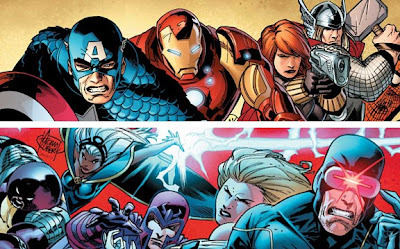 AvX Review #1: Which side are you on? The wait is over! Avengers vs X-Men is finally here, and it's everything you've been wanting and waiting for. The conflict begins now, and only time will tell who will come out on top. First off, I have to say thanks to the Sacramento A-1 Comics. Jason was telling me that they had an awesome premier party. There was a raffle that they used to give a bunch of sweet stuff like variants of the Avengers vs X-Men #1 poster, t-shirts and some awesome Avengers paper weights. 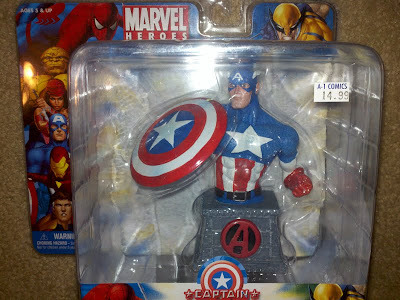 Jason managed to walk away with one of Cap. 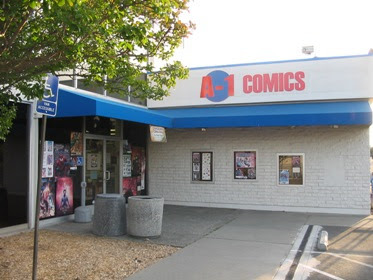 So thanks again to A-1 Comics in Sacramento! If you've been out of the Marvel Universe for a while or if this is your first foray into the universe, I recommend you take a look at this link first, they've done a good job at giving a quick summary of what you need to know as set up for the Marvel Summer event. The book opens with the Phoenix Force moving through space, presumably consuming a planet en route to Earth. Cut to Avengers Tower where Iron Man and Protector are having an ego measuring contest as Ms. Marvel arrives. Just as Iron Man is about to call in Captain America to settle things, something comes crashing down. Naturally the Avengers immediately give chase, stopping all sorts of disasters along the way. At the crash site they find Nova who only gives an ominous warning before slipping into a coma, "It's coming." Over at Utopia, Cyclops is training Hope so that she might be able to take on the Phoenix Force. Cyclops is giving her no rest or break, and is in all fact just being a giant jerk to her. Sure, he's training her for Phoenix, but let's be honest, he probably still hasn't gotten over Jean Grey. Come on dude, she's been dead a while, move on. Meanwhile, at the White House, Iron Man and Cap are letting the cabinet know about the impending doom of Phoenix. Iron Man's alarm goes off, letting them know that an energy signal similar to Phoenix's is on Earth. Captain America goes off to find the source of the energy. He sees Wolverine en route, to make sure of his loyalties. Cap arrives at Utopia as Cyclops is telling the other X-Men about how he wants to use Hope as Phoenix to restore the mutants to glory. You also see just much Wolverine and Cyclops are becoming more like Xavier and Magneto respectively. The two naturally disagree about how best to handle Phoenix, and Cyclops decides he's done talking about it. The drawing in this issue is pretty good. It does have some rough around the edges qualities to it, but nothing too bad. It's mostly noticeable in the conversational frames. The action scenes are superb though, and I giggled like a little kid again when I got to the frame I put above. 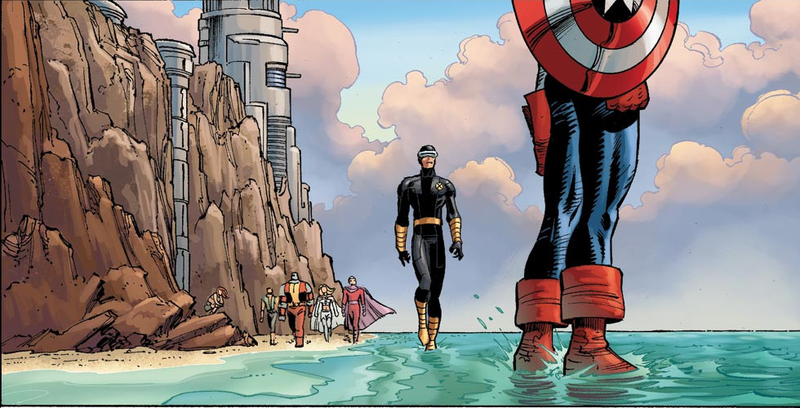 I mean, Cyclops has got a pair on him if he's going to attack Cap like that. We're in for a wild ride with this series, and the next issue comes out in just two short weeks. I personally love the story. You can jump on with only knowing... Scarlet Witch said, "No more mutants" and they were only 198 left... But Hope was born a mutant and is the focus of AvX. She was raised in the timeline by Cable as the "Savior" of the mutants and now the Phoenix force is coming for her. Cyclops is a nutbag and thinks it's a good idea to embrace destruction due to the rebirth quality of the Phoenix and the Avengers think it's a BAD idea... Wolvie and Beast seem to be with the Avengers at the start, but who knows where they will be at the end! A great setup for some epic beat downs... in the end some evil force will no doubt take advantage of the heroes beating the hell out of each other. GREAT STUFF! 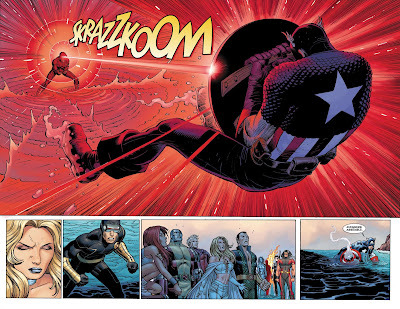 Oh and Romita Jr... Where I don't particularly like his finished art, his storytelling is great! Thumbs UP WAY UP! Finally a good MArvel story arc. Secret Invasion was the last that I enjoyed (besides X-Force that is gold). I haven't followed Marvel since House of M (although I did buy the Messiah Complex trade)... Looks good, I'll definitely have to come visit when a few more issues are out and give it a read. Damn you and Joe for keeping me grounded in DC-ville! Cyke is a doosh canoe. AVENGERS!!! Ehhhhh… I don’t know. The Phoenix… more trite X-Men plots… Cyclops being a douchey copy of Magneto… Cap doing what’s ‘right’… Super team vs. Super team… it’s all old hat. Ok… to be fair, after reading the 4 part X-Sanction and then reading the first issue of A vs. X… some parts did grab me. The end of the issue was predictable, but still nice to see. Better yet, Wolverine and Beast backing the A and not the X. But I’m just not getting into it. But the rest… meh. I was merely whelmed. If Marvel continues to do with this arc that it did for its last few ‘ground breaking’ arcs… we’re going to get 5 and a half issues of build-up and a ’15 minute’ Star Trek ending that wraps everything up all nice and neat in half a book. They did it with Civil War, Secret Invasion, Dark Reign, and World War Hulk. And not unlike those other books, I don’t think this story will have a long-lasting impact either. At least Avengers Disassembled left us with ‘No More Mutants’ and it’s held steady for 7 years. I think that’s on of the longest lasting impacts to the Marvel U in quite some time. And I'm not a fan of Romita Jr.
I’ll certainly read the books… but I don’t think it’s going make me start waving a Marvel flag any time soon.